Since the time our nation was formed, successive generations of Singaporeans like you and me have had elements of a national narrative drilled into our collective consciousness. The first element is the ‘miracle of our nationhood’ – the story of a nation that was born out of impossible circumstances, yet has risen to where we are today. The second has to do with the values our forefathers embraced – of courage, hard work and sacrifice; and the unity they forged, in spite of deep differences in opinion and outlook, to build our nation. The third is that, to keep the ‘miracle’ going is something that will continue to require work. We cannot afford to “rest on our laurels” or we will certainly lose the quality of life and opportunities that we currently enjoy. But, how do we continue to ‘run the good race’? How can this generation take hold of the baton of ensuring that this nation will continue to flourish, and how can we as fathers contribute towards this passing on of the baton to our children? As we search for the answer, we might find relevance in the Total Defence model. In his commentary from the RSIS Newsletter (1), Ong Weichong contends that the foundations of Total Defence need to be grounded in a firmly Singaporean core. Ong wrote that of the five pillars (Military, Civil, Economic, Social and Psychological Defence), our economic status has enabled the robust establishment of the Military, Civil and Economic pillars. What that could mean for us as citizens, is that we need to now build up the Social and Psychological pillars to take our country into the future in an increasingly globalised world. From a fatherhood and family standpoint, the rest of this article explores the issue of how we can continue to fortify a sense of unity with our community. Dads, if there is one analogy you can use to teach your children about the strength of community and unity, it is with the sequoia, or giant redwood tree. The interesting feature about the sequoia tree (sequoia semervirens), is in the unexpected shallowness of the roots. Compared to the enormous height of the tree – which grows in excess of 100 meters tall – the roots only grow 1.2 to 2 meters underground. It is obvious that Singapore must grow roots like the sequoia in order to survive and continue to serve as a home that our children’s children will value and cherish. We have to teach our children how to grow strong networks with their neighbours and form a strong, unified community and society. Our children need to learn not only independence, but also interdependence. We need to impart an outlook that is ‘other-centred’, and in our competitive society, it may at first appear to fly in the face of conventional wisdom. Apart from focusing on hardware, we need to teach the next generation how to to work on its heartware to build a strong community and social mindedness based on trust. We extend our innovation from the economic into the areas of building unity and consensus by forging heart connections that enable all of us to gain from our citizens’ natural diversity. How do we instill that sensitivity to community, and grow trust with one another on this island? How do we raise children who will contribute socially, and be a positive influence to the community that they will eventually lead? The spotlight needs to be enlarged from our being focused largely on the economic, to include social values that can stand the test of time. Service to others, creating solutions for the betterment of our fellow man and simply loving our neighbour are examples of things that leave a lasting and meaningful legacy, more so than a mere inheritance of economic wealth. Modeling good social behavior – Grow habits that are courteous and considerate; develop attitudes that seek to understanding our next door neighbor and the people who work with and for us. Embrace diversity – Focus on common ground, and be respectful of differences. Agree to disagree, practice mature and respectful engagement at all times. Graciousness – Being gracious is a most powerful material with which to build a resilient social fabric. Be sensitive to antisocial forces – Explain and guide our children to understand and learn how to discern assaults against our values of decency and unity. If our children are able to find a sense of community and foster a healthy interdependent society, there is no reason why we will not continue to grow as a nation, reach for the sky and serve as a positive model for a healthy and sustainable civilization. 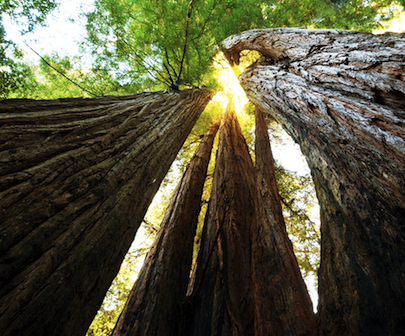 Like the legendary and long-living sequoia trees (3), our thriving future as a nation will be solidly founded – on those roots that we as individuals and families grow, intertwined with our fellow residents. Ong Weichong. Singapore’s Total Defence: Shaping the Pillars. RSIS Commentaries, S. Rajaratnam School of International Studies, NTU, dated 21 February 2011. Coast Redwood Primer. Redwood Forest Institute, http://savetrees.org/redwood2520primer.htm. Retrieved on 21 December 2012. 2,100 year-old sequoia. The Giant Forest Museum. http://www.visitsequoia.com/giant-sequoia-trees.aspx Retrieved on 8 Jan 2013.